While visiting The Works last week, I was struck by the wonderful design of Edmonton City Hall. It was a sunny day and warm enough that quite a few people, mostly children, decided to wade around in the fountain. We never had a chance to go inside unfortunately, but you have to admit the design is something else. The current City Hall, designed by Edmonton architect Gene Dub, was opened on August 28, 1992 on the site of the former City Hall. Gene Dub’s design combines the old with the new and reclaimed pieces of the old City Hall are located throughout the building. It is also designed as a ‘people place’ – not just a place for civic government, but a meeting place for Edmontonians. As far as migrating our blog from Blogger to WordPress, I think I’ve managed to get the blog pretty well transferred over from the old Blogger site. It took quite a bit of doing getting the required html code for the various widgets into the side bar. The Google Followers widget and the RV Blogs widget were very time consuming. I spent more than a few hours searching Google yesterday and this morning, looking for just the right technique to move those widgets over to WordPress. I’m a little disappointed that the RV Blog widget now lists blogs alphabetically instead of by most recent update, as the widget did on Blogger. There are lots of plugins available for WordPress nothing that mirrors the old Google Bloglist widget, well at least not that I could find anyway. If anyone knows of such a widget for WordPress, please let me know. The bottom line is that our blog on WordPress is pretty close to what used to be on Blogger. 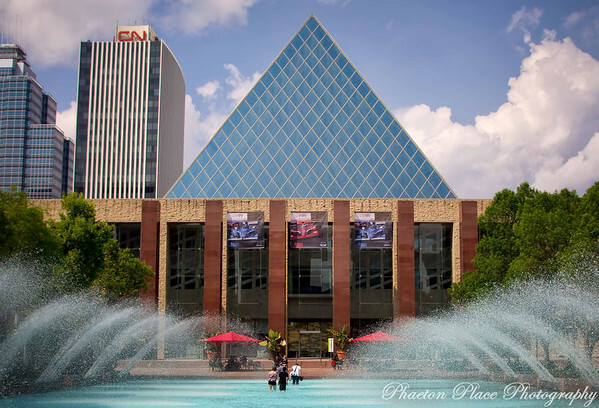 This photo of Edmonton City Hall has the distinction of being the first photo posted on our new blog too! Now just to make sure that things are working properly, I’d appreciate if readers could leave a comment on this post. The comment link is at the top of the post. Looking forward to hearing what you think. Now all I have to do is sort out my Photo galleries so I can include a link to them on our homepage, but that can wait until after Canada Day! This entry was posted in Alberta, Photography, Technology, Wordpress.